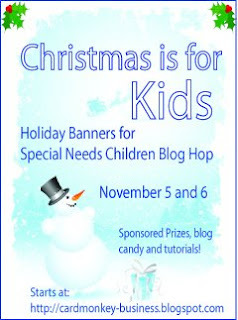 The Unknown, Entertaining Mind of Miss Dena Jones: Christmas is For Kids Banner Hop: DAY TWO! *** If you are looking for the Hello Kitty Blog Hop, CLICK HERE. The children (ages 0-21) we see are medically-fragile and technologically-dependent -- many are tethered to a ventilator that runs through a tracheostomy; most are wheelchair-bound, and cognitively impaired. They are all delightful children who face life with optimism and hope for a better tomorrow. The banners created for this two-day hope will all be sent to Ellen to deliver to Pediatric Specialty Care. 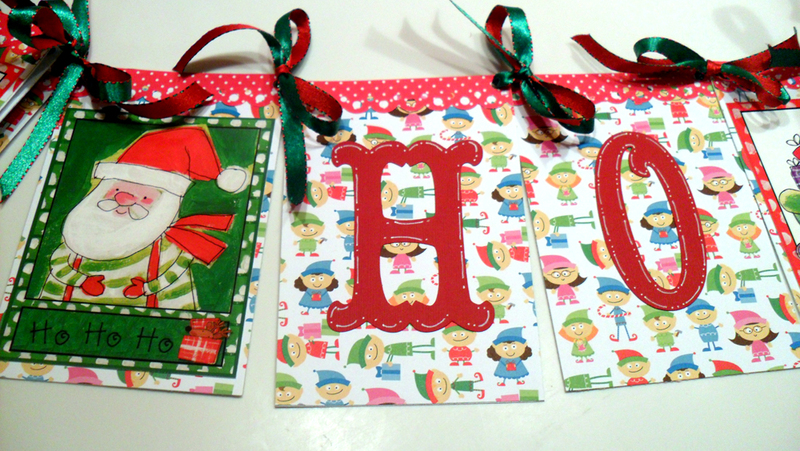 They will be hung in the doorways for the children to enjoy. Isn't that such a wonderful idea? If you would like to start with Day One's banners, CLICK HERE. If you want to start at the beginning of Day Two's (today's) hop, CLICK HERE. I created a banner consisting of ten panels, each measuring 4 x 6 inches. 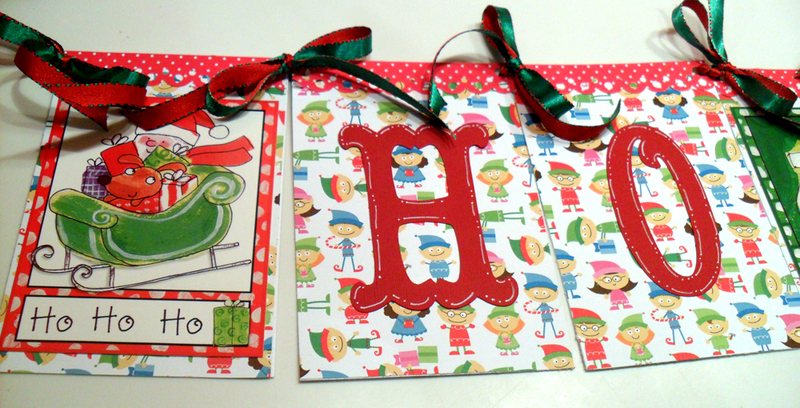 For the base, I used some super cute paper from the Santa's Workshop line by none other than DOODLEBUG!!! If you've been following my blog, you know I am a huge Doodlebug fan ! LOL! I cut each piece and then adhered to cardstock to make the panels sturdier. Since the banner has to be shipped and then possibly repacked for use next year by the hospital (I hope! ), I figured it would be best to keep the banner as flat as possible, so I stayed away from dimension on this project. I'm so happy to have been a part of this wonderful blog hop! Thanks so much for stopping by. Please visit all the blogs on this hop to see all of the beautiful banners the ladies have created for these truly special children. Don't forget that there is blog candy to be had. See Cardmonkey's blog for all the details! Your next stop is Sandie's blog. DENA! Your banner is simply adorable!! I love the traditional colors and the thoughtfulness you have put into this. With each HO I thought of words I could associate with Pediatric Specialty Care and these banners -- HOlidays, HOme, HOpe, and so on. Thank you so much for participating. YES, the banners will be packed and cherished and displayed year-after-year ... they are loved, as are you. May you always be blessed for the kindness you show. Great ho banner! Love all the sections! It's always beautiful to see traditional colors, I love your banner, it is happy and playful and colorful. A child will smile. Very cheerful colors in your banner, TFS! A beautiful, very happy banner. The child will have twinkles in his/her eyes! Stunning banner and I am sure the children will love it!!! Great hopping with you for such a special blog hop. 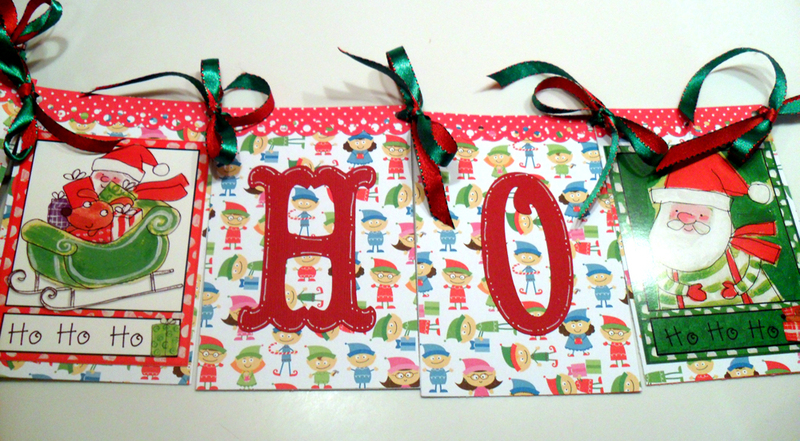 I love the background paper, those little elves are too cute! THank you so much! Your banner is so bright & cherry! My daughter just reminded today that the next Cricut cartridge we need to get is Doodlebug. Your reinforcing it!! WOW!! LOVE the banner and the details!! Thanks for sharing and I'm glad I'm now a new follower of yours Dena!!! The banner is so much fun! The papers and the images are just great together! The border punch is a great idea to add to the top! I need to use mine more than I do. SO so pretty! The paper is amazing and I really love the font :) I just love your projects. So honored to be in this hop with you!! This is an awesome banner Dena! Love the colors and patterns. It's super cute. I was in day 1 with you, nice being in the hop with you. Love it, sister!!! You did an awesome job, and what a great idea for these to be donated.